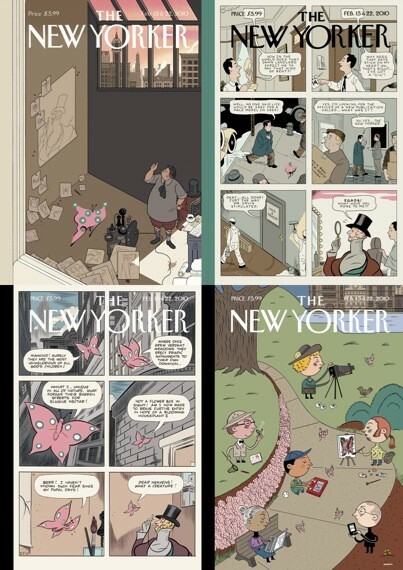 Show: "Covering the New Yorker" Talk by New Yorker art editor Francoise Mouly. Dinner: Cafecito The best damn Cuban sandwiches in town. "The less common, Argentine-influenced choripan--a dry, salty, Spanish-style chorizo with grilled onions and chimichurri--may not be for everyone, but it’s in the running for my sandwich of the year," writes Mike Sula. Show: The World Beyond the Headlines Talk by Nobel Prize-winning economist Joseph E. Stiglitz (Freefall: America, Free Markets, and the Sinking of the World Economy). Dinner: Piccolo Mondo Located in one corner of the Windermere, an enormous old Hyde Park hotel gone residential, this spacious, sunny room is two-thirds trattoria, one-third Italian deli. Show: The Searchers We may still be waiting for the Great American Novel, but John Ford gave us the Great American Film in 1956. Dinner: Medici on 57th The quintessential off-campus hangout, complete with carved wood booths and graffiti-covered walls. The reasonable prices at this long-standing Hyde Park gem make it a favorite among students and locals alike. Show: Wild Beasts Brooding and dark, Two Dancers works hard to create its strangely seductive pull: the most dynamic song, "All the King's Men," juxtaposes ominous chants with shrill yelps, and the tenor vocals of Tom Fleming have an undercurrent of hothouse salaciousness a la Nick Cave. "Wild Beasts are an acquired taste, but that second spoonful is worth the trouble," writes Kevin Warwick. 9 PM, Schubas, 3159 N. Southport, 773-525-2508, $15, $13 in advance, 18+. Dinner: Los Moles Vagabond chef Geno Bahena, one of Rick Bayless's most renowned (and elusive) disciples, returns to ply mole in this modest Lakeview spot. "In a city increasingly cluttered by average-to-disappointing Mexican fine dining, Bahena--despite his past unpredictability--is still one the city's most talented chefs in this arena," writes Mike Sula. Show: People Under the Stairs "Active since 1997, the duo of Thes One and Double K came up at a time when underground hip-hop—which, once upon a time, was basically another way to 'old-school'—had legs, and they've soldiered on even as their preferred sound has drifted to the extreme margins of the genre," writes Peter Margasak. Dinner: Babylon Eatery This Bucktown spot turns out food every bit as good as that of some of its more regal counterparts, and at half the price. Show: Breakfast Club: The Totally 80s Musical! Though it waffles between tribute and satire, Jason Chin's adaptation of The Breakfast Club not only brings John Hughes's classic 1985 film to life but makes it burst into song. Dinner: TAC Quick "Young Andy Aroonrasameruang, formerly of Banana Leaf, and his likable staff probably make it easier than anywhere else to get traditional stuff the way it's eaten in Thailand. Aside from the regular menu there's a clearly translated Thai menu available by request with almost 40 items you're not likely to encounter elsewhere without a working knowledge of the language," writes Mike Sula. Show: Jump Rhythm Jazz Project JRJP's 20th-anniversary program offers plenty of the company's unique mix of percussive movement, scatlike vocalizing, and musical theater, but two premieres by artistic director Billy Siegenfeld take off in new directions. Dinner: Chicago Curry House "As far as I know, this is currently the only place offering Nepalese dishes within the city limits. Notable appetizers include the lamb choela, tender chunks of marinated meat with strips of nearly raw ginger, and spicy ground chicken- or vegetable-stuffed momo, which resemble Chinese soup dumplings and are served with a thick, powerfully tasty achaar made from pureed almonds, coriander, sesame, mustard, and cardamom seeds," writes Mike Sula.